Shyam Benegal must be applauded for making the film “Bose: Forgotten Hero,” and almost succeeding in making it a memorable one. The film traces the journey and hardship undertaken by Netaji Subhas Chandra Bose, fleeing from the British from his Calcutta home and going to foreign shores to set up the Indian National Army (INA) to fight the occupying British forces in India. One can’t vouch for the historical accuracy of this biographical film on the legendary patriot. But it does appear that the director has well-researched his subject. The action and war sequences are well choreographed, and do evoke a feel of the period, action and the times it has tried to capture. The early life of Netaji is sorely missing from the narrative. 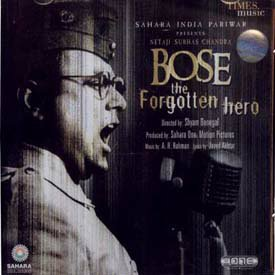 One does understand the monumental task Benegal had on his hand while dealing with a subject such as Bose, but it would have added to the strength of the work if the early inspiration of Bose, the magnetism that drew people towards him and his growing affinity for the nationalistic cause was woven into the narrative. Sachin Khadekar in the titular role puts up a good performance. Benegal also avoids the controversy surrounding Netaji's death, and ends the film emphasizing the contributory role Netaji's violence movement played in quickening the process of granting freedom to India by the Imperial power.